Lead generation and creativity aren't two separate things; creativity is how you generate leads! Nobody wants to read the same old boring sales messages. They want unique value! Unfortunately, this is a widespread misconception. Creative vs analytical. Content vs strategy. The truth is, these things are mutually exclusive and to deliver results, there must be a blend. Here are five ways content based lead generation results depend on creative quality - how first-class content, design and UX drive lead generation and conversions. When you think about how leads are generated, you have to acknowledge the role creativity plays in the process. Since 2006 inbound marketing has demonstrated the value of content as currency. Web visitors deposit contact details in return for well-crafted, high-quality, useful content. Of course, a web visitor will only do that if the content is good enough. ‘Good’ equates to helpful, enjoyable, career-improving or life-enhancing. And this is the heart of the intersection between creativity and lead generation. If the content is boring, the leads won't flow. The two are inexplicably linked. How do you create 'creative' content? There are plenty of ways to create 'creative' content. From the way it's written to the design and the idea behind it. But let's start with the idea. Your idea is the most critical part of the creative process because bad ideas don't tend to work. It's important to suggest bad ideas as they often develop into good ideas! Secondly, you need to think about how you execute the idea. For example, let's say you're writing a blog about using LinkedIn for career progression. How will it be styled? Are your brand colours on the front? Is it similar to LinkedIn's brand colours? Where are you sharing it (LinkedIn, maybe?!) and remember, your team are there to help you! Consider scheduling a content brainstorm to hear their ideas. All these ideas mix into the melting pot, and once it's released you'll have a lead generation machine! See how you can create inspiring content marketing material by looking at these content marketing examples. A well-structured editorial plan drives quality traffic. Many professionals fail to understand how difficult it can be to generate quality ideas on a consistent basis. Plans stall and they stop producing content before they've got into second gear. The first three or four might be corkers. But to keep that up week after week, how do you maintain that level of inspiration? The trick is to have truly creative people on your team and strong ideation practices. The market is increasingly saturated with content and readers are fast to separate the wheat from the chaff. Content must break through the noise. Every article or video you construct must be well-developed, useful and markedly different to what others are putting out. What's the one piece of information everyone sees? Whether it's in an email or posted on social media? Your headline or caption! To generate more traffic, it has to be intriguing. That doesn't mean fill it with unnecessary adjectives and complicated comparisons. Being frank and telling someone you have an answer to their problem works. Give it a go! You could also consider inviting a guest to spill their ideas onto a page or a video. Getting someone else's perspective can give you ideas you wouldn't have thought of otherwise. But remember, your headline could be catchy and your guest writer well-known, but if the content isn't good enough it won't affect your lead gen results in a positive way. The way you format content determines how effective your content based lead generation is. In recent years we’ve seen content displayed in a quiz, calculator and template format. Inventive formats offer enhanced value to the user and can improve lead generation results. How you format the content is key. Content with technical backing could include apps, interactive interfaces or macro-enabled spreadsheets. Fusing tech with content increases the opportunities marketers have at their fingertips and delivers even greater value to the user. Leads will flow when content is clever. You can achieve some remarkable things if you have a creative spark and a developer on hand! The Food Capitals of Instagram shows which foods are most popular in different cities all over the world. On the interactive map, you can see that New York City has the most bacon hashtagged photos on the platform, with London coming in second! Mmmm. There are tonnes of ways you can display creative content, from bubble charts to word clouds and tree diagrams. Don't overcomplicate things though, simplicity works! If people see something they don't see every day or something that helps them solve a problem, they're more likely to become a lead. Social isn’t on everyone’s agenda, but if it has the potential to contribute to lead generation it’s a worthy consideration. In increasingly saturated social media channels, you must separate yourself from the noise. Updates fill our feeds and platform algorithms make it tricky to stand out. To achieve results, campaigns must be consistent and creative. Bold and visual updates connected to high-quality content are the best way to drive traffic and high-quality leads that convert. Give social managers licence to experiment and invent, and own the channel. Don't rely on scheduling. While scheduling certainly helps (if you've got something you know is going out, schedule it! ), there will be times when things happen on a day-to-day basis. You might secure a project, or a staff member might achieve a milestone with the company. You need to be social savvy and remember that all good news should be posted! Let your customers know you're doing well! Being authentic and posting quality, entertaining content means people are more likely to follow your business. If they're a follower, they could develop into a lead! 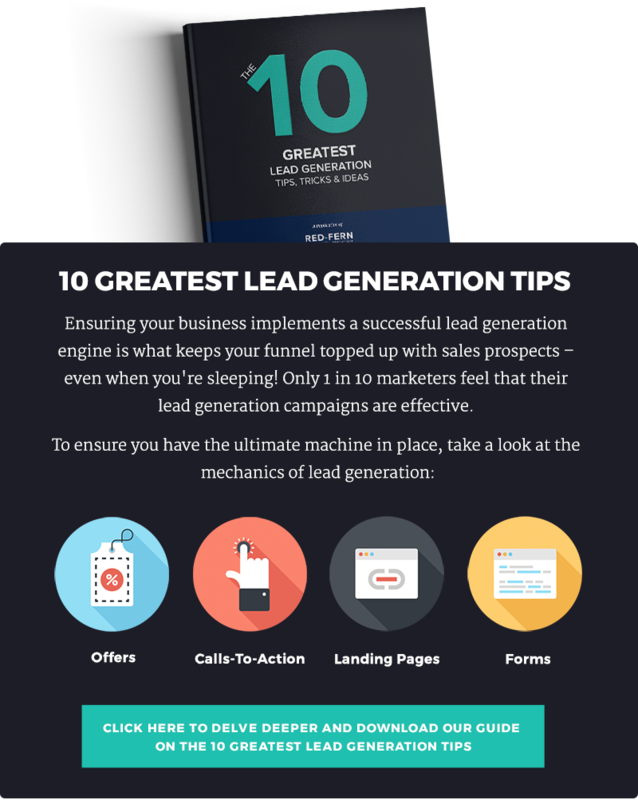 Linked to the last point, it’s important to recognise that every element of lead conversion is a link in your lead generation chain. Ultimately, you want the power to analyse them all. A webpage can be measured by its visitor acquisition contribution. A link can be assessed by its click-through-rate (CTR). Landing page forms can be examined across assets to see how they compare. All of these are visually determined. The creative execution of each plays a vital role in its success as a lead generation ‘link’. Consider the many ways a designer can create a call-to-action in your latest ebook, and you begin to grasp not only the many variables we have at our disposable but the importance of creativity in generating leads. Lead generation depends on the content, and the content has to fit into a journey you want your customer to take. The keywords they type into Google to access your article, content. The blog they read, content. The form they fill out, content. The email they receive after downloading your asset, you get the picture! It's important to add context to that journey, and that comes from what we discussed above. The idea, the way it's written, the way it's designed. How it's executed, the journey the user goes on. If you want to generate more leads, you need to start being creative. Now! Download our free ebook to see how you can take advantage of content based lead generation more leads.